Piemonte, the northwestern corner of Italy, literally translates as "foothills," the foothills of the Alps. We'll study the region's fine red wines for this month's Wine Focus. Bright and tart, zippy red fruit and mouth-watering acidity on the palate. Excellent food wine. By either its Italian name "Piemonte" or the English version "Piedmont" the northwestern corner of Italy literally translates as "foothills," the Italian foothills of the Alps. We'll study this region's fine red wines for this month's Wine Focus. This topic will allows who prefer a high-end, ageworthy wine for holiday feasting to splurge on a fine Barolo or Barbaresco - both made from the Nebbiolo grape - or slightly more affordable Nebbiolo wines including Gattinara and Ghemme. Those who want to stick with relatively low-price "recession-buster" wines may choose from an attractive range including the widely available Barbera or Dolcetto or the deliciously berry-scented Freisa. But wait! There's more! With fully 50 designated D.O.C.G. and D.O.C. wine-producing areas - the most of any Italian region - Piemonte offers an array of choices from the fizzy red Brachetto d'Acqui to such rarities as Fara and Sizzano. Piemonte also makes its share of whites, including the immensely popular bubbly Asti (formerly "Asti Spumanti") and the widely distributed Gavi still white. With so much wine to try, however, let's stick with the reds for this month's Piemontese exploration. You're also invited to select the real Italian wines if you can find them, but for those in parts of the world where Italian imports are rare, feel free to discuss locally grown Nebbiolo and others; at least a bit is produced in California and Australia and, I expect, other regions as well. I actually sneaked in a Piemontese Barbera in last Wednesday's edition, Michele Chiarlo 2006 "Le Orme" Barbera d'Asti. 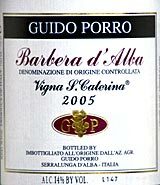 For today, I offer another, the somewhat more pricey Guido Porro 2006 Santa Caterina Barbera d'Alba. For more background on Piemonte, its foods and wines, one good resource in English is the Italian Trade Commission's Piedmont page, http://www.italianmade.com/regions/region2.cfm, with information and further links tp articles about its regional wines and food, traditional dishes and a map. FOOD MATCH: Made for red meat, a fine companion with pan-seared natural strip steaks from Kentucky's Dutch Creek Farm. VALUE: Toward the high end for Barbera at my local price in the lower $20s; in fairness, it's a very high-quality Barbera, but the U.S. importer suggests a $17.50 retail price, and Wine-Searcher.com shows it in the middle teens in many parts of the U.S. WHEN TO DRINK: Delicious now, but under temperature-controlled cellar conditions it could evolve for a decade from the vintage. The U.S. importer has a short report on this wine in his October newsletter. Page down about halfway through the PDF file to find the references to Guido Porro and his wines.